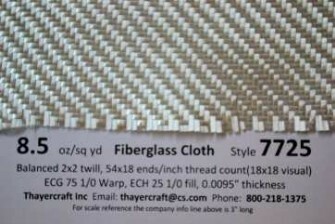 Style 7725 fiberglass cloth is an 8.5 oz/sq yd 2 x 2 twill with a soft clear silane finish for any resin. 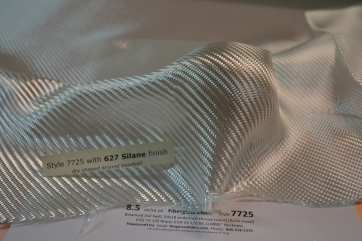 7725 is very conformable and this as it's advantage has the disadvantage of being somewhat squirrely and easy to fray. 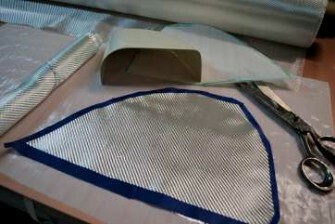 One technique I use to help in this regard is using Masking tape all around the border larger than the area I need the piece to be, wetting out on butcher paper, cutting through the paper and wet out 7725 inside the previously cut masking tape and putting this assembly in place removing the transfer paper after. 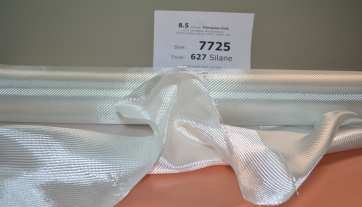 We have limited quantity of the style 7725 fiberglass and is why there are only small rolls here.